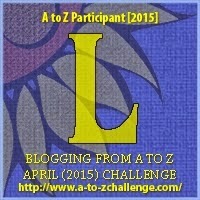 Today's 'heart things, heart strings' theme for the letter L in the A to Z challenge is Laughter. You may have heard or not that the average child laughs about 300 to 500 times per day: Wow! Adults on the other hand? Well, that's another story! Do you really wish to know? It's rather sober: adults laugh only about 15 times a day. Dr. Madan Kataria introduced laughter yoga to the world in 1995 when he learned about the physiological and psychological benefits of laughter. 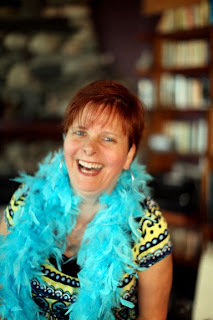 O yes, I need to practice some more of laughter yoga :) I find I am becoming more 'serious' by the day! That's a lovely picture of you, Elly. Infectious laugh you have. Lovely picture of you Elly. I have heard of Laughter yoga but never tried it. I need to practice laughter yoga too, I guess. But I know I laugh more than 15 times a day. But a child laughs 300 to 500 times? :O that is a milestone we adults can hardly reach! Love your photo, Elly! Your good humour is infectious. ☺ Laughter yoga was unknown to me; what a cool idea! We definitely need more laughter in our lives. It's a great cure-all. Hubby and I make each other laugh. A great joke or a funny movie are good for that too. the joys of a hearty laughter, when the belly starts aching and tears stream down :D Long time since I laughed so hard. Laughter indeed has so many benefits.